Homemade Fish Ball Soup. Prepare your very own Fish Ball Soup. The authentic way to make them is to use Tengiri or Parang for the Fish Ball. If you care for Tangchai, add this too, washing it first. Remove fish flesh from skin and bones, scraping it off with a spoon in thin layers. Chop fish a little on a wooden board or pass through mincer, then pound using pestle and mortar, adding water in which 1 tsp of salt has been dissolved. Mix well with fingers, scoop up pounded fish and throw the lump into the mortar several times to get it smooth. Form little balls oiling your fingers slightly to prevent fish sticking to them, and drop them in a bowl of salted cold water. Put aside till required. Mix 300g fish and 300g prawns for the pounded mixture; or use 300g fish for fish balls and 600g prawns for prawn balls. Add pounded mixture chopped bokgi, which is used in chapchai (optional). Add stock which has been strained and salt and pepper to taste. When boiling, add the fish balls and allow to simmer gently till fish balls are properly cooked. Add the sohoon and serve at once. 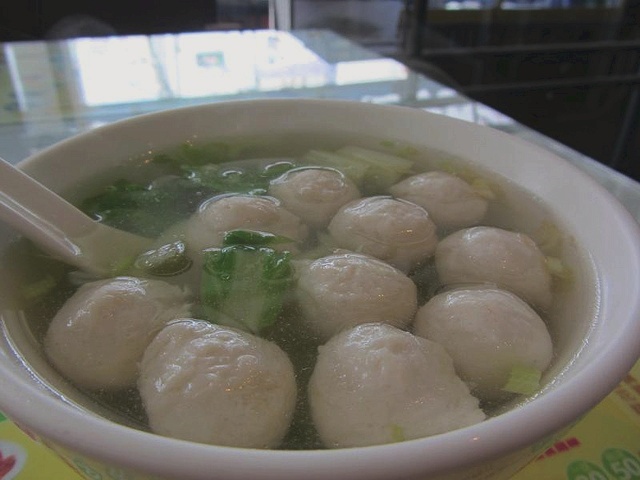 Put shredded lettuce into dish and pour over it the fish ball soup. Garnish top with chopped celery, spring onions, coriander leaves, fried onions and sliced chillies. If you care for tangchai add this too. Cannot see chicken wing recipe, got problem there?? ?Pls check.